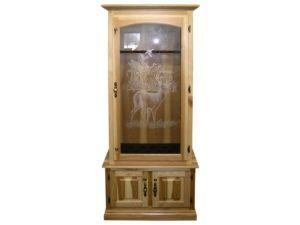 Check out the Gun Cabinets from Brandenberry Amish Furniture. And start storing and displaying your guns and ammo in style. 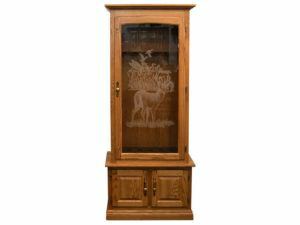 Because Amish artisans custom-make each cabinet from solid hardwood plus other top quality materials for strength, durability and great looks. Strength and style meet in the 8 Gun Cabinet. Beautiful glass mullioned doors highlight the Custom Gun Cabinet. A stunning wildlife graphic and solid construction accent the Gun Cabinet. The Hickory Gun Cabinet boasts fine craftsmanship. Presenting the best quality, custom-made Gun Cabinets available. And they’re from Brandenberry Amish Furniture. The units offered can store eight to 12 guns. Skilled Amish cabinetmakers painstakingly handcraft each unit. And they use premium hardwoods. Like oak, maple, cherry and hickory. Plus skills handed down from their ancestors. So the Amish men build the wood gun cabinets very sturdy. And, with proper care, the cabinets may well become family heirlooms. What’s more, we install locks on each door for added safety. Plus interior lights show off your firepower. Also, wildlife graphics on the doors enhance the look and hunting theme of the cabinets. You can customize your cabinet of choice. Just tell us your preferences regarding wood, stain and hardware, among other features. Or, you can order the cabinet as shown or unfinished.